On the above Hi-P Chart, we saw that using ART bottom master system, most of the Bottom master Signal picks at the right point, this actually shows that the market is responding to the price fall, Every time Hi-P stock drop too much, someone is picking it up and cause the reversal. 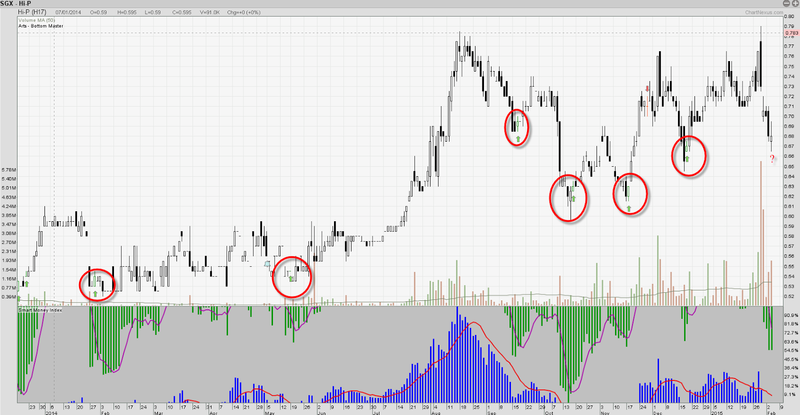 Thou today the signal is not out yet, the chart already tell me how I should trade this stock. Basically, buy when it drop and form a reversal and place a stoploss below the low. Strong sales of Xiaomi phones would lead to significant boost to revenue. New Nantong plant will improve cost structure and expand production capacity. New dual-screen YotaPhone 2 offers potential sales boom. High FX volatility among USD, RMB and SGD may result in significant impact, given its high net transactional currency exposure. Business operates in highly competitive and volatile industries. Sales heavily reliant on key major customers.